I was amazed as we went north on the Smoky Creek trail from the Mule Ears to the Dodson at how this trail has/is disappearing into the landscape and wanted to warn other folks to really be prepared by both familiarizing yourself with the terrain and map and keeping a sharp eye peeled for random cairns. Heading North to South is somewhat easier but the exits from the washes and the cross country sections are either not marked or barely marked. Here is a Caltopo map for reference. The only prominent cairns marking an exit are at the up stream exit above Witch Spring, you can see them here above our packs. It is similar on the Witch spring cut over but there are sections of worn path that you can occasionally see. The exit from the wash to the right below Witch and Hermosa A, north of Sugarloaf, which goes over the ridge and back down into the actual Smoky Creek drainage used to have a sign which is now gone and was marked with a tiny 3 stone cairn. It is also very hard to follow but fortunately it is mostly in a small wash. The exit/junction with the Mule Ears trail is marked by a cairn up on the wash cut bank on the right which you need to watch for and then over the hill is a metal trail sign. Going north is even harder. You have to keep a close watch for the right hand wash turn above Willow spring and below Rhyolite, there was a small 3 or 4 stone cairn. The sign you are on the right path is just up the wash you will come to a pouroff you have to climb around on the right. The exit above Lizard spring is hard to find and has a tiny cairn. The exit out of the wash above Hermosa spring A to go above Witch spring is absolutely not marked or visible and the same for the exit above Witch on the the long ridge. It is a great area and route but just want to warn folks that this is not like following the Dodson or the Mule Ears trail, be prepared! Wow. Frankly, that’s an appalling case of dereliction on the part of NPS. It’s not like we’re talking about Telephone Canyon or Apache Canyon or Maple Canyon, where you know you’re taking you’re fate into your own hands if you insist on exploring there. This is an official named and signed trail. Hundreds of hikers a year will pass that sign on the Dodson and be tempted southward, perhaps to their peril. The park needs to get a trail crew out there, or stop signing and recommending the trail. Pondering if this is more 'nothing to see here' type behaviors (e.g. Cattail)...where upcoming hiking guide releases will conveniently omit. Telephone canyon trail was easier to follow and that is saying something! Agree, for at least the western portions of the TC, some cairns are huge, a few square like pillars. 3 or 4 stones hardly constitutes a cairn as the Quemada grasses have recovered so well and a good gully-washer could wipe them out anyway. Thanks so much for the heads up ME! Thanks for this head's up. SCT is on my "to-do" list for the spring. Yeah, that was exactly my thought, too. Except that it is such a great connector trail to the north and south. I can't see them trying to do away with it. I will also add that other than the few cairns at the wash entrance and exit points and a few along the out of wash sections I saw no cairns along the washes. When Robert and I walked the southern section from the River Road to Mule Ears in 2016 we saw not one cairn the entire 7 miles but it does stay entirely in the wash down there. Again I am not really complaining about this as I like and am used to finding my way cross country but I can see less experienced folks getting really turned around down there expecting it to be like the Dodson they just came off of. No, the NPS doesn't need to do a thing. The situation is perfectly fine. If folks need a maintained trail to hike in the "wilderness" then perhaps they shouldn't be out there. Anyone venturing beyond those trails having guide brochures and numbered posts should be conversant with navigation, and carry and be able to use map and compass (or a real GPS; not the module in their phone, and especially not the iPhone with the newly confirmed downgraded performance of older models). It doesn't matter one whit that it's a named and signed trail as once you let go of the hand of a funny hatter, you are on your own. Exploring desert and mountain country on foot requires both mental and physical preparation. 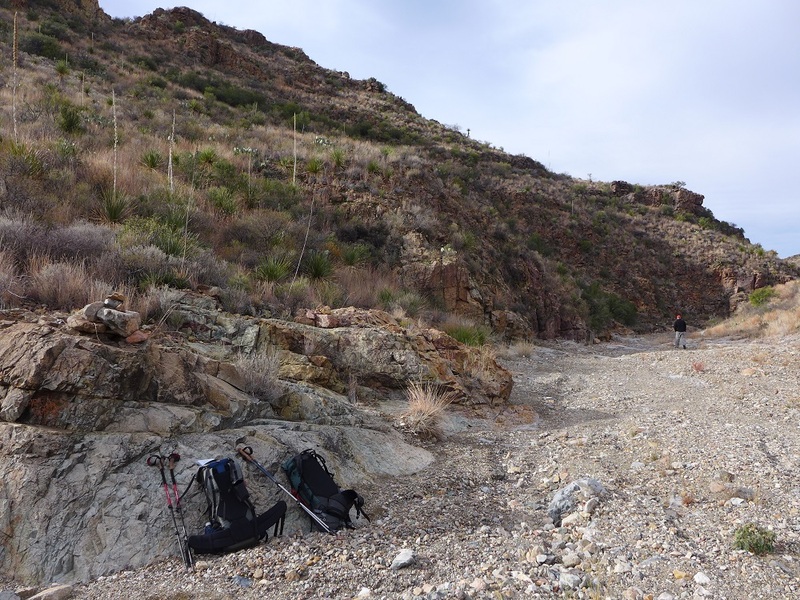 Trails vary from well maintained in the Chisos Mountains to primitive and barely visible in the desert. Plan hikes within your ability. Remember, you are ultimately responsible for your own safety. It took the NPS many years to tell tourists that tidbit and admit it's dangerous out there, and the agency paid dearly for failing to do so when they lost lawsuit after lawsuit for instilling an expectation that they would hold everyone's hand in parks. In addition, it is recommended that you carry a topographical map and a compass, and know how to use them. 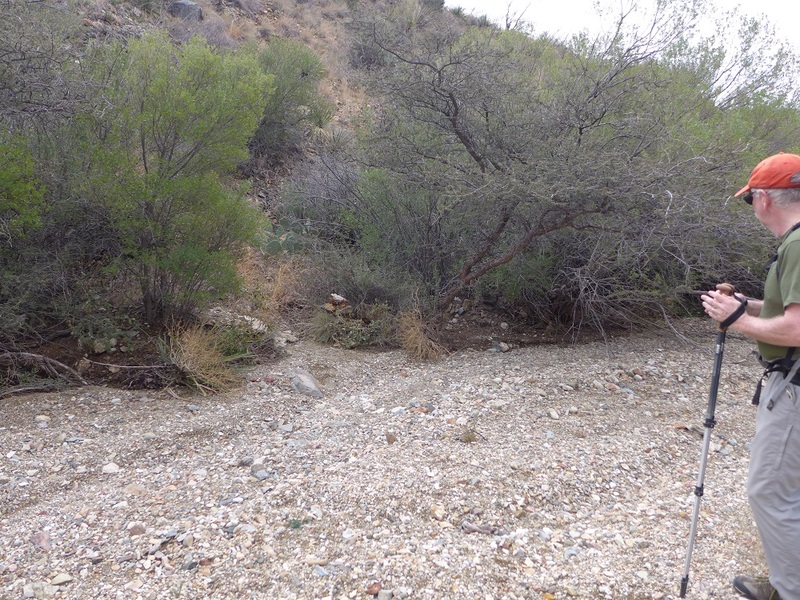 Many trails, especially those in the desert areas of the park, are poorly-defined and can be difficult to follow. You can warn people all day long about hazards and still they press on to their demise in parks. The NPS should have a generic warning, tuned to the location: "Enjoy your visit but, remember, the desert (mountains, river, glacier, ocean, etc.) will kill you if you let it (or do stupid things)." End of story. There is a fascinating book I picked up on my recent (and extremely uncommon) occasion to be at any NPS area other than Big Bend. At the Grand Canyon I obtained "Over the Edge: Death in Grand Canyon" which details many of the more than 750 fatalities in the canyon (includes non-NPS areas of the canyon). The astounding range of ignorance and stupidity in the face of obvious danger and abundant warnings is stupendous. 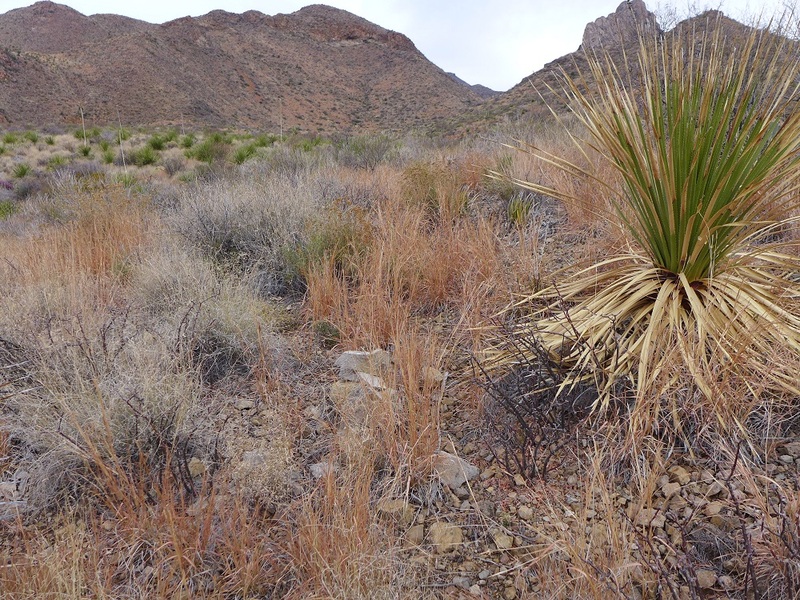 I'm perfectly comfortable with the NPS managing the deserts of Big Bend as an entirely un-trailed wilderness. That said, don't get me wrong, there are some gnarly areas (such as the cairned route over the shoulder from Telephone Canyon to Ernst Basin) where I REALLY appreciate the cairns and the effort that went into putting them there. But if the cairns weren't there, I'd figure a route out for myself, albeit slowly and with some trepidation. But the operative word here is "trail". If the NPS is going to sign a route as a "trail", then, by golly, there needs to be a trail. Otherwise, it's false, and dangerous, advertising. We can tilt our noses at folks who can't manage an off- or poorly-trailed route, but it's crazy to blame folks for following bad official advice. Fix the trail or nix the sign. Anything less is crazy. Novice question: Is the NPS wholly responsible for establishing and maintaining cairns, or can any random hiker (ie, experienced hiker) build and/or reinforce marking cairns? The NPS is very clear about trails. To repeat: "Many trails, especially those in the desert areas of the park, are poorly-defined and can be difficult to follow." That constitutes a warning to be heeded or not. Grooming and maintenance is unnecessary. I see no bad official advice on any of this. No one is requiring anyone else to walk anywhere in the park, much less even encouraging them to do so simply because something is labeled "trail." The decision to do so is entirely personal. If anything, the NPS is overly-protective in discouraging use by over-rating the difficulty of trails and roads. Undoubtedly, some folks can see "difficulty" ratings as a challenge and attempt things they are inexperienced or unequipped to do. But, they do so of their own volition (of course, they may express intent to a funny hatter, who then attempts to dissuade them). Just because a path may be indistinct and hard to follow does not make it not a trail, nor require that it be ignored as a trail. Indeed, except in the most open of desert terrain, much off-trail hiking is done on game trails, which are unmaintained, unofficial and unmentioned. But in that instance, many folks who don't spend a lot of time in undeveloped areas are unlikely to even notice such a trail as they are conditioned to maintained ones. Noting a trail by name but not maintaining it may be an affront to the typical NPS clientele, but it does not require removal from public view. The secret Compendium is silent on this (so far...wait for it to be included at some point). Undoubtedly, the NPS would frown on the public doing this (even though it's probably been done for decades) as they have no control over the act. Lacking control over the public is one of many things that keeps them awake at night with worry. There's actually danger in trusting cairns without a commensurate ability to navigate without reliance upon them. Accepting a cairn as accurate without also knowing where you are by virtue of your own abilities can lead to trouble. Keep in mind there is no cairn that cannot be destroyed, or even moved to inaccurately indicate navigation points, to satisfy some desire for mischief (or worse). Haha! You anticipate one of the points I intended to make in an upcoming installment of my latest trip report. Your scenario occurred to me in one of my darker moments during a cold, rainy, foggy slog. I have been mislead by cairns heading up the wrong wash, built by people "bread crumbing" their route no doubt and then not knocking them down. Happened to me in fact on the Smoky Creek trail in 1998 and took me several hours to correct my temporary misplacement.